NEMOX GELATO PRO 5K CREA IS A PROFESSIONAL GELATO, ICE CREAM & SORBET MAKER. It is the most compact fully automatic table-top unit. Made in Italy. 120V/60Hz/1 Phase - 650W, AUTOMATIC program and storage, Automatic storage function. S/S case and paddle. Air cooling. Gas R404. Optional removable bowl. 1.25 kg every 12-15 minutes or 5 kg / 7 L / or 7.4 qt per hour! 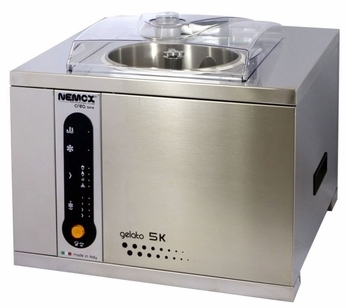 The professional ice cream machine Gelato Pro 5K CREAships by truck on a pallet. The shipping cost will be added to the order amount upon determination.